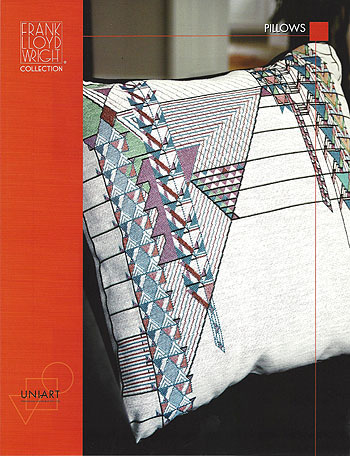 Schumacher Fabric Samples 1986. 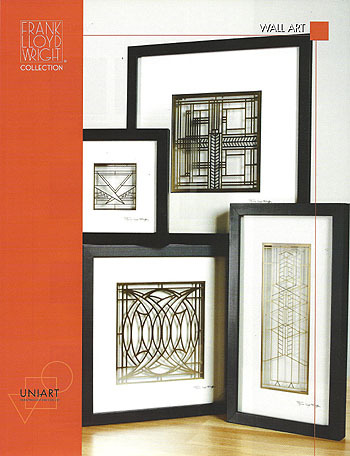 FLW F86 Series, 26 samples 4" x 7.5". 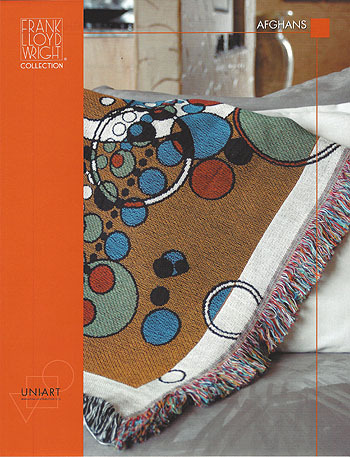 Schumacher Fabric Samples 1986. FLWWF86 Series, 28 samples 3" x 5 "
Schumacher Fabric Samples. Frank Lloyd Wright Series. Seventeen fabric samples by Schumacher. Label on verso: "Frank Lloyd Wright, Exclusive Schumacher Woven. Schumacher." A) Tulip Tapestry: 1) Clay Springs 28202; 2) Quartzsite 28203; 3) Vermilion Cliffs 28204; 4)Verde 28205; 5) Black Peak 28206. 54" wide, 137 CM. B) Coonley Weave: 1) Putty 56700; 2) Clay 56701; 3) Blue 56703; 4) Garnet 56704. 54" wide, 137 CM. 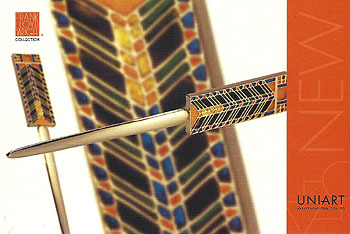 Boxelder "Windows" Ties, 1997. 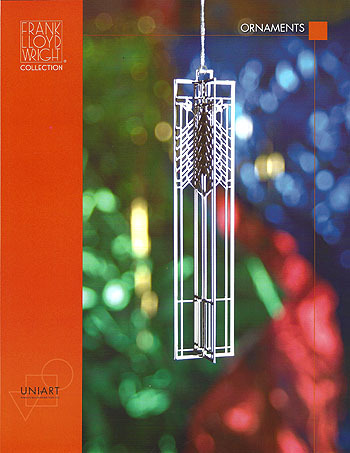 "Inspired by a design of Frank Lloyd Wright, Certified by The Frank Lloyd Wright Foundation. �Tree of Life� Window. Darwin D. Martin House 1904. Made in Italy. Boxelder, Milwaukee. 100% Silk." Inspired by the windows of the Martin House. Boxelder was established in 1989 to manufacture and sell M. C. Escher licensed silk neckties. Upon their success they added the Frank Lloyd Wright collection. 58" long x 3.75" wide. Original retail value $37.50. 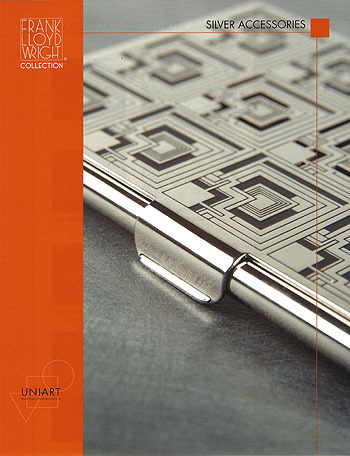 1999 Schumacher�s Frank Lloyd Wright Wovens Series. 82 Loose Woven Fabric Samples. 1999 Schumacher�s Frank Lloyd Wright Sheers Series. Eight Sheer Fabric Sample Booklets. Midway Gardens Side Chairs 1986 (1913 - S.180). Midway Gardens was designed by Frank Lloyd Wright in 1913, built in 1914 and demolished in 1929. This Midway Garden chair was designed by Wright in 1914, but never produced. In 1986, Cassina produced a line of furniture designed by Frank Lloyd Wright. Cassina 603 Midway 2. "The Characteristic of this chair is the lightness of the steel rod structural framework. It is part of a set that includes tables built along similar lines." Cassina Catalog, 1985, p.16-17. "Chairs in glossy enamelled steel rod, white, red, blue, or grey. Removable seat and back padded with polyurethane foam. This model is also available without padded back. Fabric upholstery." P.40-41. Matching tables sold with square or round crystal glass tops. The base is in glossy enamelled steel rod and available in white, red, blue or grey. Printed on base, "Cassina �. A Design by Frank Lloyd Wright. Certified by The Frank Lloyd Wright Foundation." Stamped in frame: "1017" and "1053." Steel frame is in red enamel, seat in red vinyl. 34.65" High x 15.75 Wide x 18.12" Deep. Seat is 18.31" High. Two chairs. 2001 Nakoma Clubhouse Furniture and Fabric. 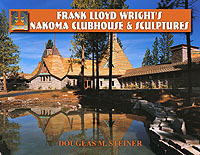 During the beginning of June, 2015, we were notified that the Nakoma Gold Resort in Clio, California, was retiring and selling off the original furniture designed by John Rattenbury and the Taliesin Architects in 2001. Like the collaboration between Frank Lloyd Wright and George Niedecken during the beginning of the nineteenth century, Rattenburg also worked with Wright. John Rattenbury became a member of the Taliesin Fellowship in 1950, worked closely with Frank Lloyd Wright for nearly a decade. He worked on 60 of Wrights projects, including the Guggenheim Museum, the Gammage Auditorium and the Marin County Civic Center. Richland Center Bicentennial Souvenir Spoons 1976. Emblem has a profile of Frank Lloyd Wright. Richland Center, Wisconsin. Frank Lloyd Wright was born 26 miles from Taliesin, Spring Green, in Richland Center, Wisconsin, the location of the A. D. German Warehouse (1915 - S.183). Designed by Wright in 1915 as a brick and concrete building, it was capped by a pattered block on the fourth floor. These spoons commemorate the Bicentennial of the United States. Test on face: "Bicentennial 1976. Birth Place, Frank Lloyd Wright, Richland Center Wis." Text stamped on verso stem: "Corwill-Holland." Two sets, box and spoon. Spoon: Top Emblem: .75 x 1". Bowl: .8 x 1.4". 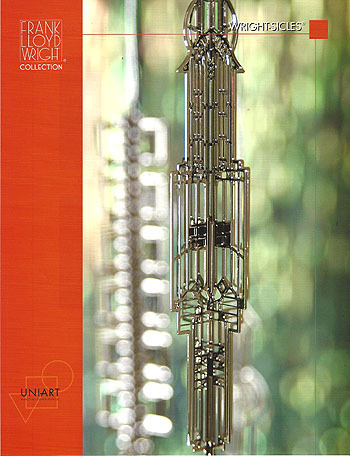 Length: 4.6". Box" 5.5 x 1.5 x .5"
2004 Nakoma Sculpture Reproduction (Left), Circa 1992. "Originally designed by Frank Lloyd Wright in 1923 -1924 for the Nakoma Country Club in Madison, Wisconsin, to be 16 feet tall. The Nakoma sculpture is a curvilinear design, symbolic of the earth and Mother Nature as well as domestic virtue. Her back is a continuous circle, with a round head and she holds a round bowl. Nakoma also carries a papoose and has a child at her side. Produced by Nichols Bros. Stoneworks, Woodinville, Washington. 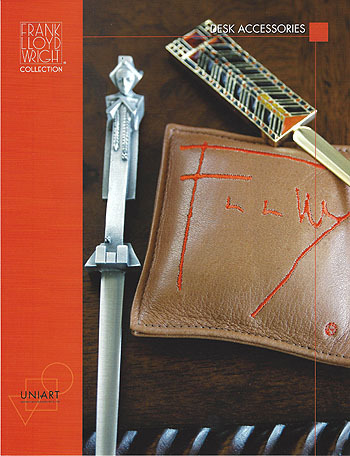 Authenticated by the Frank Lloyd Wright Foundation. Cream Reconstituted Stone. 70 pounds. 24" high. Gift from Paul Diederichs. 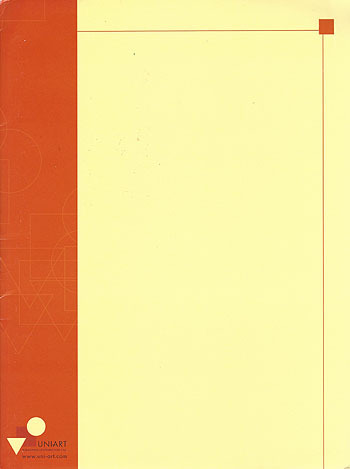 Description: Red and yellow folder includes 17 single flyers printed two sides and one four page brochure. Also included in the folder is one postcard (2003). Gift from Kathryn Smith. 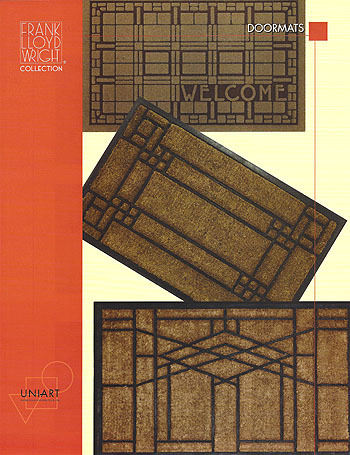 Size: Folder 9 x 12, Single Sheets 8.5 x 11. Postcard 6 x 4. Single Sheet: 1) Afghans: Midway Gardens; Coonley Chenille; Waterlillies; Heurtley House; Tree of Life; Coonley. 49' x 67, 53 x 65. 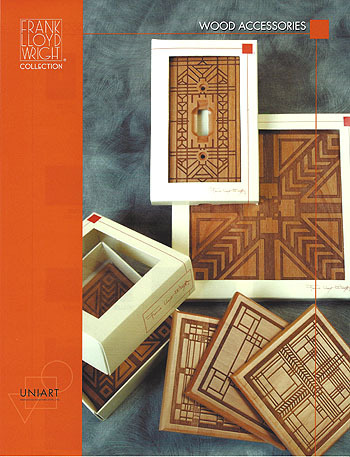 Four Page: 2) Coasters: Liberty Covers (4); Art Glass Designs: (4); Metal insers (8); Masselink (4); Mural Detail Blue (4); Rug Designs (4); Surimono (4). Single Sheet: 3) Desk Accessories: Heath and Sprite Letter Openers, 7.75 and 8.5" long; Lake Geneva Magazine Rack, 11 x 13.5 x 11; Signature Drafting Weight, 4" Square. Single Sheet: 4) Doormats: Boynton, Martin and Robie. 18 x 30, 22 x 36. Single Sheet: 5) Glass Ball Ornaments: Waterlilliews, Cabaret, Dana Butterfly, Copper Urn. 4". 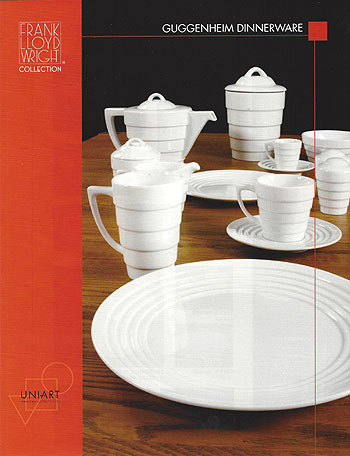 Single Sheet: 6) Guggenheim Dinnerware: Biscotti Jar; Teapot; Sugar & Creamer; Coffee Mug; Espresso; Cappuccino; Salt & Pepper, Cereal Bowl, Dinner and Salad Plates. 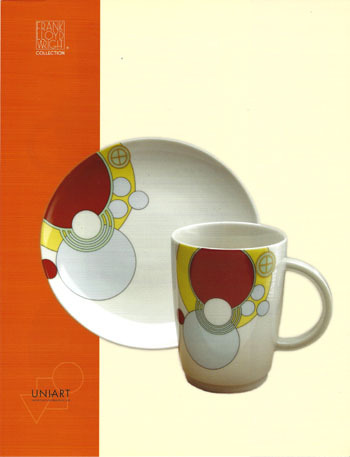 Single Sheet: 7) Imperial Hotel Cabaret Chinaware: Set of four 12 ounce mugs $22.50. Set of four 8 inch plates $22.50. 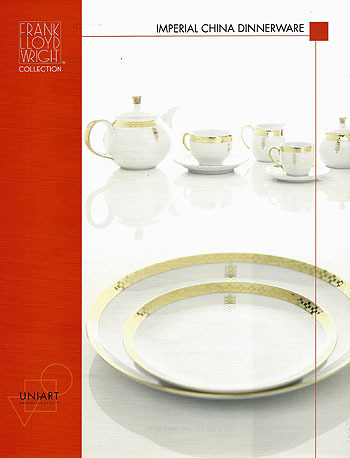 Single Sheet: 8) Imperial China Dinnerware: 5 piece Place Setting, Cream & Sugar; Coffee Mug; Demi-Tasse Cup & Saucer; Teapot; 9 and 6.5 bowls, 16 inch Platter; 4 inch keepsake Dish; Cup & Saucer Gift pack of 4. Single Sheet: 9) Ornaments: Steffen�s window; House Beautiful (3); D.D. Martin; Dana Sumac; Barton (2). Single Sheet: 10) Pillows: May Basket; September Desert; Hillside Theater Curtain; Saguaro Forms; April Showers. Single Sheet: 11) Silver Accessories: Ennis, Millard and Storer House Card Case; Ennis, Millard and Storer House Key Ring. Single Sheet: 12) Silver Accessories: Hoffman, Hollyhock, Beth Shalom, Avery Coonley, Home & Studio Card Cases. 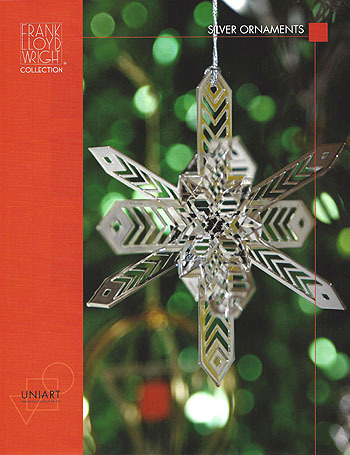 Single Sheet: 13) Silver Ornaments: Luxfer (3); Rookery; Robie; Thomas; Dana (3), Francis Grille; House Beautiful. 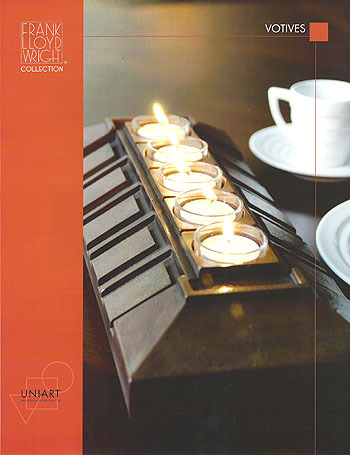 Single Sheet: 14) Votives: Little and Robie Houses; Luxfer Prism. Single Sheet: 15) Wall Art: Willits; Blossom; Boynton (2); Robie (3); Moore; Luxfer; Thomas: Coonley; Hollyhock; Waterlillies, Dana; Sprite. 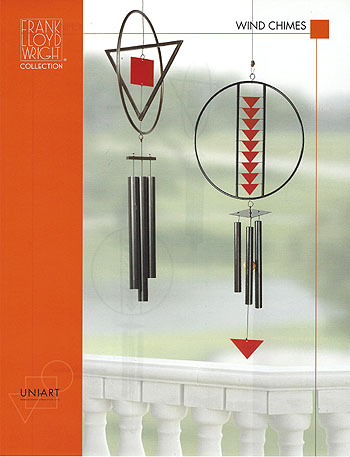 Single Sheet: 16) Wind Chimes: Organic Elements; Midway Gardens. Single Sheet: 17) Wood Accessories: Boynton, Willits, Dana-Thomas and Heller Switch Plates; Boynton, Willits, Heller and Robie Trivets; Boynton, Willits, Heller and Robie Coaster Sets. Single Sheet: 18) Wright-Sicles:Hollyhock, Chauncey Williams, April Showers, Nathan Moore, Home & Studio and Dana. 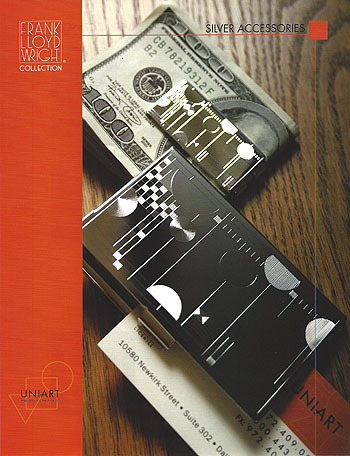 Postcard: (2003) Heath Letter Opener, $19.50.